It started as an Extended Project (EPQ) when I had finished my AS levels at the Godolphin and Latymer school. I wanted to create something to do with Economics to strengthen my UCAS applications, but I did not want to do an essay. I thought of something that would be fun to make while I could still reinforce my AS level knowledge. 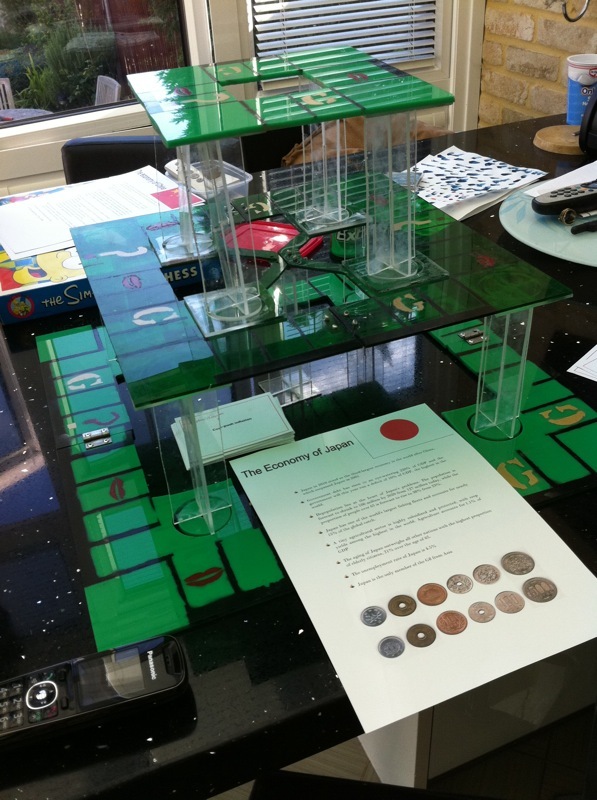 After a brainstorming session I decided I wanted it to be a 3D game different from all others, I decided on three layers all getting smaller, and the aim was to ‘work your way to the top’. Green was the colour I wanted to use as it represented money. This was made out of acrylic and the bottom two layers had hinges to fold in half. I created three types of game space. The question mark for short revision questions, the G for graph questions and the lips for describing ecnonomic terms in a time limit.